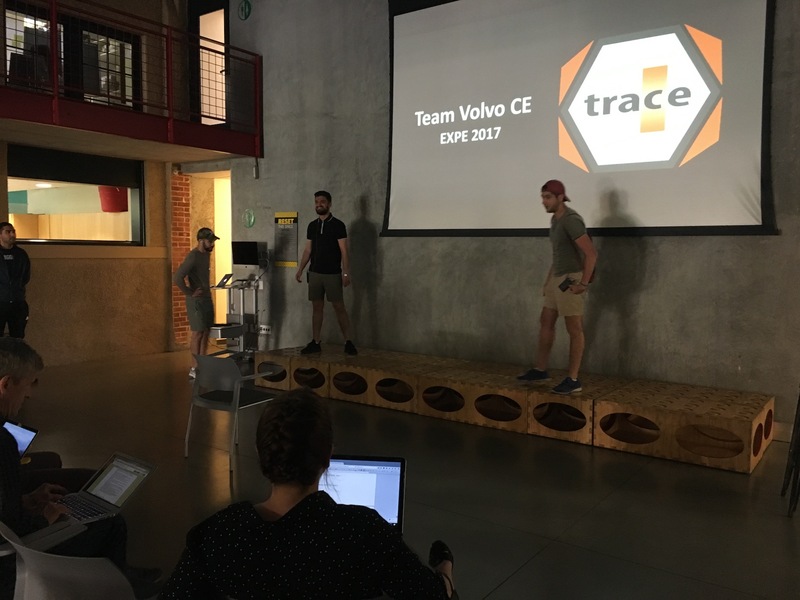 The Volvo CE Trace delivered at Stanford EXPE 2017! As the summer approaches the yearly ME310 project with Stanford University draws to a close. This years’ projects were presented at the d.school on the Stanford campus in the heart of Silicon Valley in California. Louise, Nasser, Kristian, Alex, Hassan and Noor at the EXPE Booth. 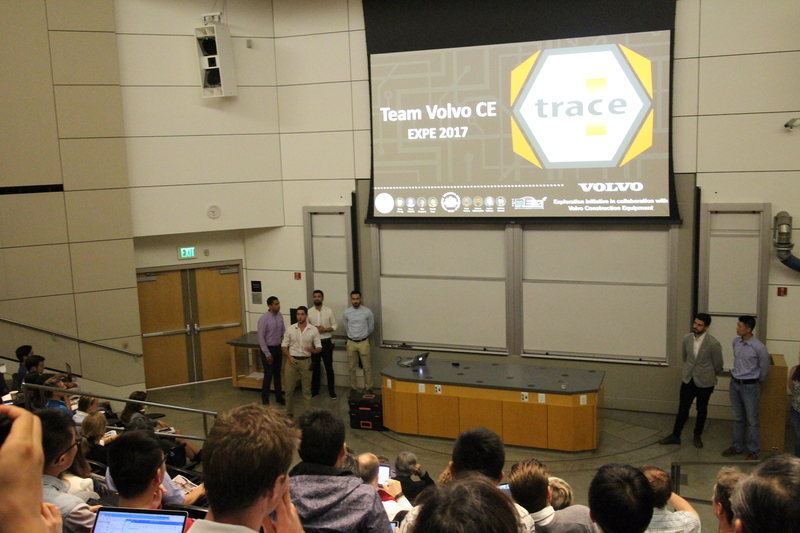 The EXPE 2017 (http://expe.stanford.edu/) featured 8 global design innovation projects with partners Volvo Construction Equipment, Audi, Ford, Huawei, SAP, Nestlé, Innospring, and Xylem Analytic. The BTH project this year was performed in collaboration with the project sponsor Volvo Construction Equipment, a long term research partner of the Product Development Research Lab. 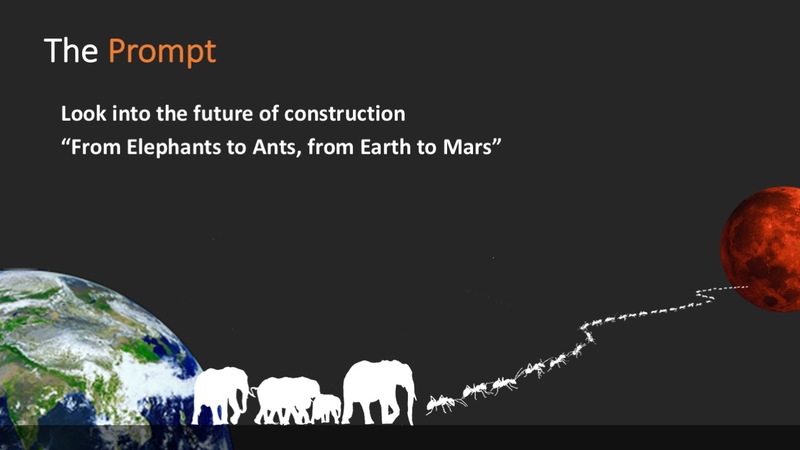 The prompt; From Elephants to Ants, from Earth to Mars. The prompt for the project this year was “from Elephants to Ants, from Earth to Mars”, by which Volvo CE provide the students with a challenge that should focus the design on the impending switch to autonomous machines and further down the line; autonomous site operations. With this switch, machines are envisioned to become smaller in size and at the same time greater in numbers, enabling operators to take advantage of swarms of construction machines. Another important aspect is that the sites should be self-sustained in an autonomous sense and be in remote locations, perhaps even on other planets. 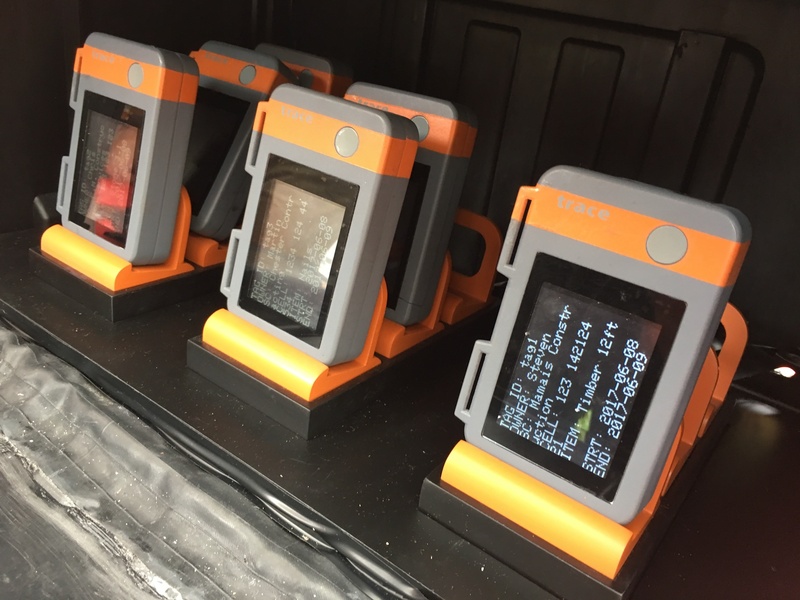 Trace is a system that provides management and location support for materials at a construction site. The students discovered a challenge in managing materials throughout a construction project. The site is typically highly volatile, where materials are constantly moving around – and quite often in the wrong place, even being in the way of the work that is scheduled to go on at a point in time at the site. Essentially, implementing lean is extremely challenging in this dynamic and sometimes chaotic environment. The students have therefore focused their design efforts on developing a system that allows users (e.g., foremen, engineers and other workers at the site) to track and plan the locations as well as the necessary movements of the materials. This will allow them to plan and execute their work in a much more predictable and efficient manner. The Trace Tag on a pallet. The Trace Tag is attached on the material at the site. This is a device with location logging capabilities, which register location and movements in the cloud. With information about wanted movements and positioning, the user can decide what is the best option to reposition the material. The user can query, either via the onboard display, or via an app with augmented reality (AR) capabilities, what material it is, who owns it, where/when it will be used on the site as well as where it is supposed to be stored and when. 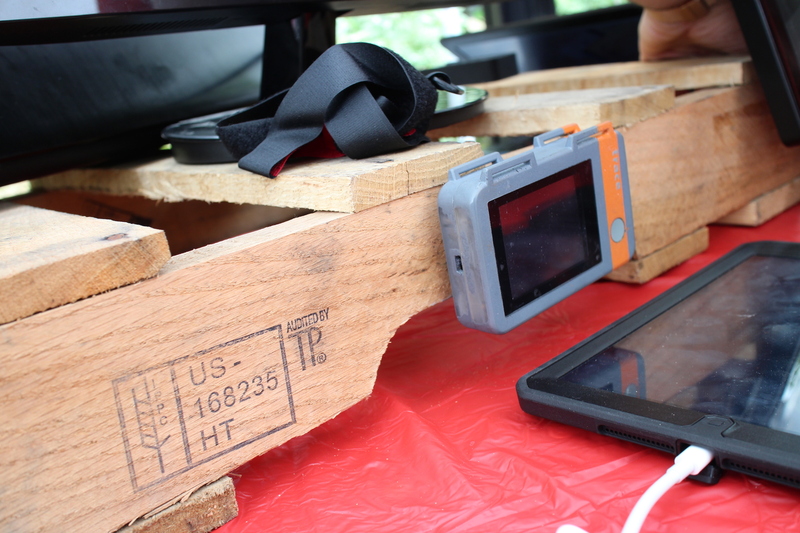 Using a tablet app, site workers can retrieve information about the material. The app includes a system that allows an area to be reserved at a certain time and a path planning feature that intelligently finds the most efficient route around obstacles. All Tags are managed and charged in a hub unit that works as a base station for programming and managing tags before they are attached to the material. When we fast-forward to the future scenario when the site will be populated with smaller, electrified, and autonomous construction equipment this site will allow the machines – as well as the people – on the site to “talk” to the material and ensure that they can track and move the material to where it is best served at the current point in time. With the Trace system, the path to implementing fully autonomous and electrified site operations is a quite bit shorter. 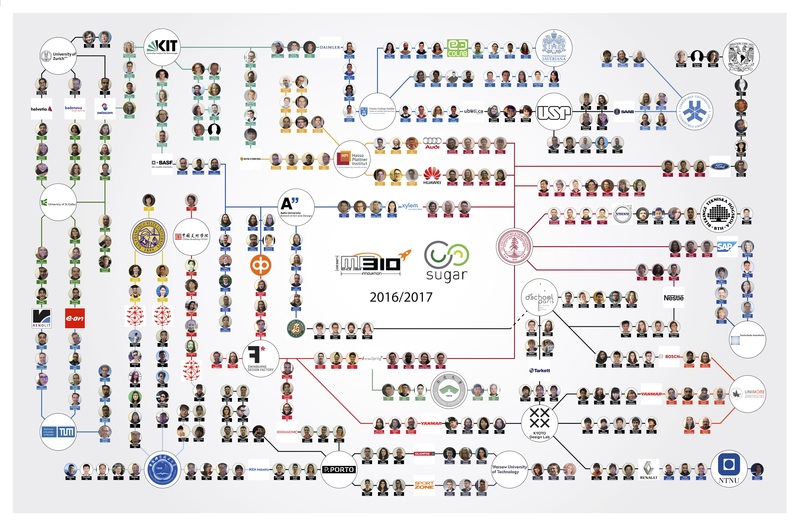 The ME310 course at Stanford University is a three-quarter global design course starting in October and finishing at the EXPE event in June. The course features nine corporate-sponsored projects that all have global partner universities from around the world. For the last five years, mechanical engineering at BTH have been the only Swedish participants. Sponsors include major global brands, such as Volvo Construction Equipment, Audi, Ford, Huawei, SAP, Nestlé, Innospring, and Xylem Analytic. 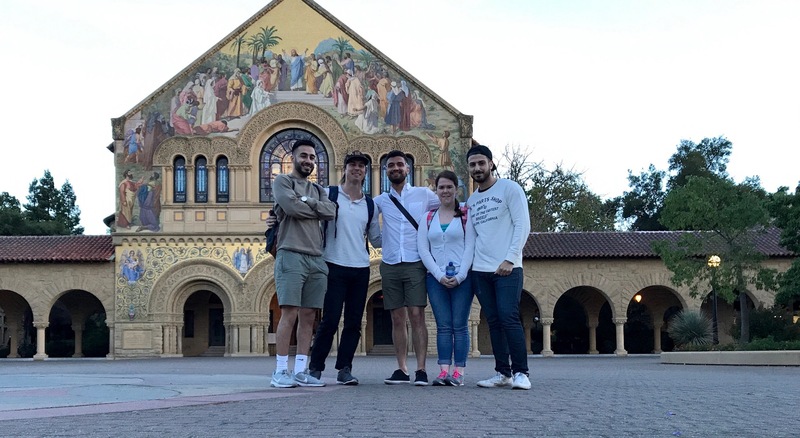 This years’ course project started in October and then in January all global teams travelled to Stanford for the global kick-off, where all team members as well as the corporate liaisons gather at Stanford. As this year’s kickoff was a little later than normal, the students were tasked to use the week to work on one of their missions, the Dark Horse prototype. Another important motive behind colocating the teams quite early in the projects is to spend effort to build a good team spirit, which will enable effective collaboration over the coming months when they are geographically dispersed. The curricula is built in three main phases, one per academic quarter. The first is about learning about the users and the problem. A lot of the work is about getting out into the field and interfacing with prospective users wherever they may be. Methods and tools on Needfinding is at the center of this activity. The second quarter is about exploring the design space and really working to bring forward the challenging, crazy and innovative ideas that takes the topic and the partner companies forward towards the future. Finally, the third quarter is about bringing the product to life. 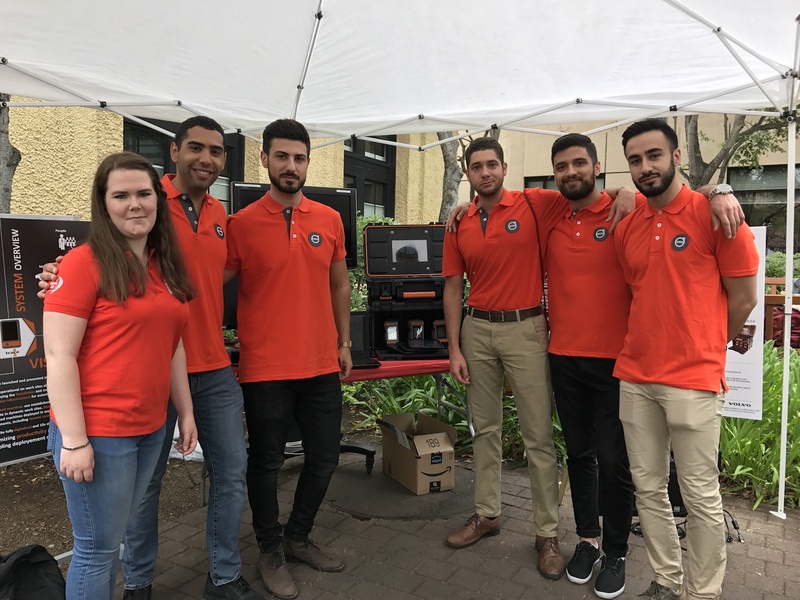 At the end of the project, at EXPE in june, the students need to present a designed, engineered and functioning product that they have manufactured. At the heart of the course there is lots of prototyping to explore the design space and learn about the users and how to best serve them with a well-designed product. “From my perspective participating in ME310, working in a global project with Stanford’s design program, is the best experience for a student aspiring to work in an engineering design capacity. The level of skills, motivation, support and resources from corporate partners and participating universities that come together during these eight months are second to none in this field”, says Christian Johansson, who has been the faculty coach from BTH. “Playing the ‘game’ and thriving in the process and culture of design thinking with a close focus on wicked design problems, user needs, and an iterative design approach fuelled by prototyping, is an experience that makes the students strong in their future careers whatever they may be”, Christian continues. Team and coach Ryan at Stanford’s main quad. 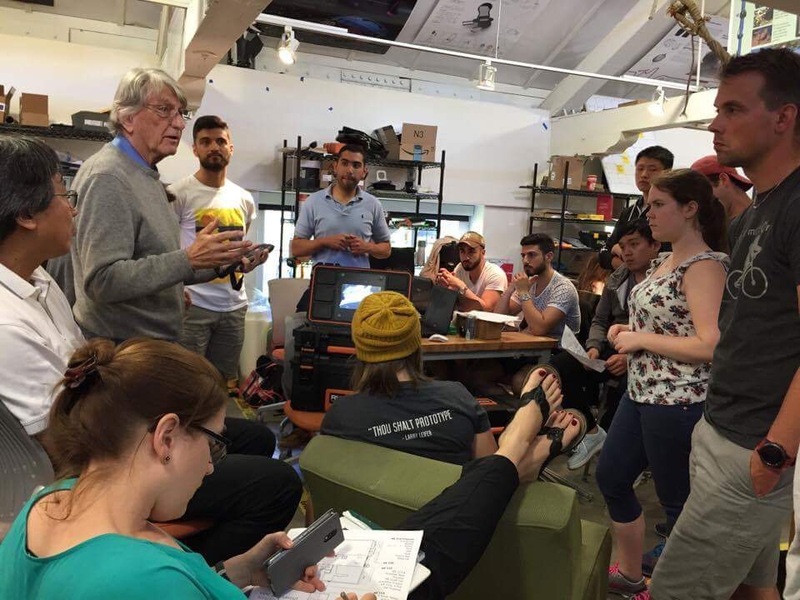 On May 23 the team departed Sweden to travel to their teammates at Stanford for the final push to bring the project home at the Stanford Design EXPE on June 8. For the coming two and a half weeks everything needed to come together for the final display, which included final prototype development, creation of a contextual story for the presentation, booth experience design and building of props. Creative conflict was the common theme throughout the final push. Both teams worked tirelessly into the late hours of the night until they were able to reconcile their differences into one cohesive narrative tying together the prototype, the prompt and their needfinding. Taking a good story and turning it into a presentation requires repetition and most importantly honest feedback. In this case it was provided by the Volvo CE sponsors and Larry Leifer himself. Small Group Meeting with Teaching Team at the Loft. While the narrative and presentation were complete, the hardware builds always fall into the trap of “this should work”, but nothing is known until it’s built and tested. Wisely the team set early deadlines accounting for any unforeseen issues and were able to pull it all together. Hassan and Alex presentation rehearsal in d.school atrium. “Finalizing the project and the surrounding factors demanded time and effort. Luckily we had enough support from teaching team and liaisons as well as the availability of tools at Stanford University. The campus offered all types of machines, rooms and labs to be able to tweak the final product into perfection”, says Hassan Safawizadeh from the BTH team. “It was a stressful time with sleepless nights, but it sure was worth it. The project resulting in something attractive and exciting made it even better,” Hassan concludes. 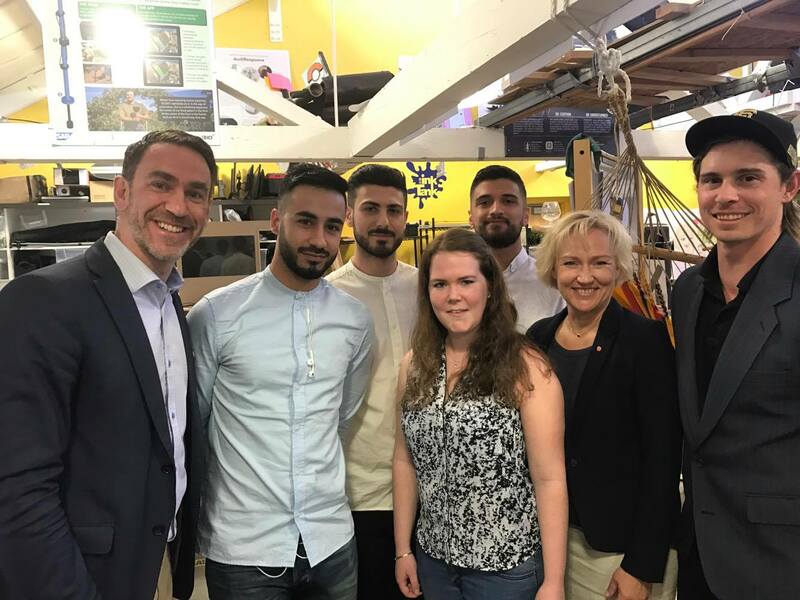 In the middle of the work, the Swedish Minister of Higher Education and Research, Helene Hellmark Knutsson, dropped in at The Loft to meet the students and get a tour of the d.school facilities. Upon entering the loft it was clear the group was taken aback by the inspiring nature of seeing so many hands and minds busy crafting innovative solutions for the future to come. While the team explained their process Helene engaged them with comments conveying her understanding of the topic and encouragement for the globally collaborative nature of the work. See the full article here. “Allowing the Minister and her aides to observe the design process in motion provided tangible evidence of impact-fulness the unorthodox Design Thinking approach can offer” Said Team Coaching assistant Ryan Ruvald. Then, on June 8, in a full auditorium in William R. Hewlett Teaching Center on the Stanford Campus, the students took the floor for their presentation. Alex, Hassan, Nasser, and Noor delivered a truly professional presentation, leading the audience through the motives and findings, as well as some of the key design iterations that culminated in the final product, the Trace system. “Again, ME310 Global Design Innovation and the Design Thinking approach is proving itself to be a valuable experience for both students and partners. For BTH students to be able to collaborate “in real life” with one of our research partners, and also with prestigious Stanford University, is simply a great experience. Challenging, but also rewarding”, says Professor Tobias Larsson of BTH Mechanical Engineering on the performance of the students. 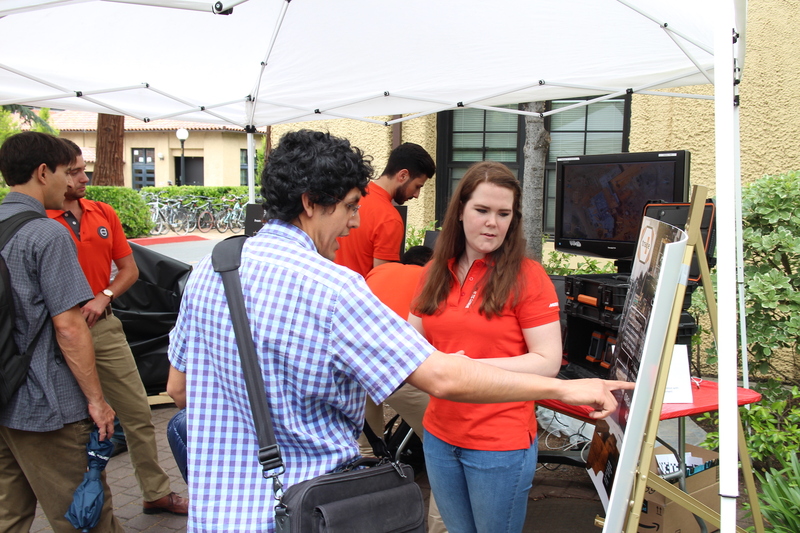 In the afternoon the whole team was on hand to demonstrate the product and system in a scavenger hunt, drawing much attention to the display booth. Louise talks about the solution at the display booth at EXPE design fair. With the conclusion of the ME310 project, the results are now turned over to Volvo CE for further exploration and development, with a view towards an autonomous construction site. While doing the ME310 project, the students have also completed their master theses. Each student have had their own thesis project within the scope of the main ME310 project to focus on. Each has contributed with valuable insights and results to the main result that became the Trace system. Louise has focused her work on the Product-Service System perspective of the Trace solution. Noor and Hassan’s thesis focus has been on the design of the main unit that is to be used by the Trace system. Kristian’s thesis is oriented towards aiding the implementation of material management on construction sites with a focus on the systems side.